Are You Being Bullied About Your Hair? Do you feel as if you are being bullied about your hair choices? On one hand, there are Black women and girls who eschew dangerous chemical relaxers and instead rock their God-given afro-textured hair, and often experience bullying as a result. Husbands or boyfriends sometimes complain about natural afro-textured hair and even threaten to abandon their Black female mates if those women don't go back to creamy crack and Brazilian weaves. Celebrity women and little girls are not exempt from hair-bullying. Solange Knowles, Blue Ivy and Tamera Mowry have all experienced vicious verbal attacks on social media surrounding their afro-textured hair. Members of the natural hair community are quick to point out that naturally straight haired women and children, no matter how disarranged their hair may be, never experience such furor. Additionally, many Black women and girls who wear their afro-textured hair have experienced bona fide threats to their educations and careers. Tiana Parker, Vanessa Van Dyke , Tiffany Brian, Rhonda Lee and certain black women in the U.S. Army were either forced or nearly forced to leave their schools or places of employment due to institutional discrimination against afro-textured hair and hairstyles. But women with relaxed hair also feel judged. They complain that they are accused of being sell-outs and self-loathers by "natural hair nazis" when in reality, they are just making a hairstyle choice that feels comfortable and convenient. A new documentary entitled "My Hair My Voice" seeks to present a balanced perspective on women of African descent and hair. Nadirah Iman and Quenell Jones, the filmmakers behind "My Hair My Voice" interviewed me for the documentary. I discussed my children's book that honors afro-textured hair, "Sunne's Gift". I recently decided to turn the tables and ask the filmmakers some questions. Read the questions and answers below. 1. What inspired you twp to create the film? Quenell: "Why are there so many Black women wearing relaxers and weaves?" Nadirah: "I'm not exactly sure"
Quenell: "We should make a documentary"
Nadirah: "there is one about black hair already"
Quenell: "Why should there be only one?" This conversation sparked a year long process of research and discovery. We proceeded by conversing with friends and family members about their personal hair stories, reading several books about Black Hair culture, and spending many hours at research libraries like the Schomburg Center in Harlem, NY. 2. How is your documentary distinct from other documentaries about black women and hair? This feature length documentary "My Hair My Voice" is exploring the History, Science, and Art Form of Black hair. Our documentary will showcase the vast diversity of hair textures that exist within the natural hair culture. Also it explores the intimate perspective of a woman who is transitioning from relaxed to natural hair. During the research phase of making this film Nadirah, the Director, decided to transition from chemically processed hair back to her natural hair. For the better part of a year of filming we have been documenting the evolution of Nadirah's hair journey. 3. What has surprised you the most about black women's testimonies regarding their hair? Prior to embarking on the journey of developing "My Hair My Voice", Nadirah had a perception of African American women with looser textured hair. She presumed that they "have it easy" when it comes to hair grooming. It is a texture that Nadirah admittedly desired during her youth. What Nadirah was surprised to learn while listening to black women's testimonies was that many of them have very similar challenges of finding the right hair products to being ostracized for having looser textured hair. 4. When do you expect that the movie will come out? Our anticipated time-frame for completion is towards the end of 2015. 5. What do you hope that viewers will take away from the movie? "My Hair My Voice" wants the viewers to appreciate the unique history of black hair, respect the science, and admire the beauty of their own hair textures. 6. How can readers support the film right now? With our intention to showcase Black Hair across America, we have filmed in New York, New Jersey, Massachusetts, Maryland, Pennsylvania, and Illinois for the past year. 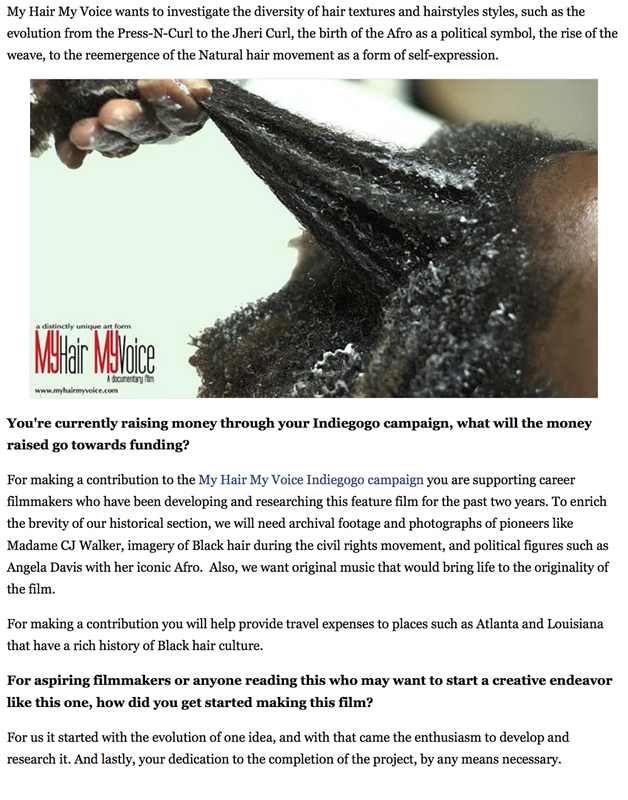 We are especially asking your readers to financially support our film, "My Hair My Voice", by contributing to our IndieGoGo campaign. Director/ Editor Nadirah Iman and Cinematographer Quenell Jones featured on the New Dimensions Radio Show. New Dimensions Radio Show WNYE - 91.5 FM has 1.2 million listeners in the New York, New Jersey, Connecticut and Pennsylvania area.